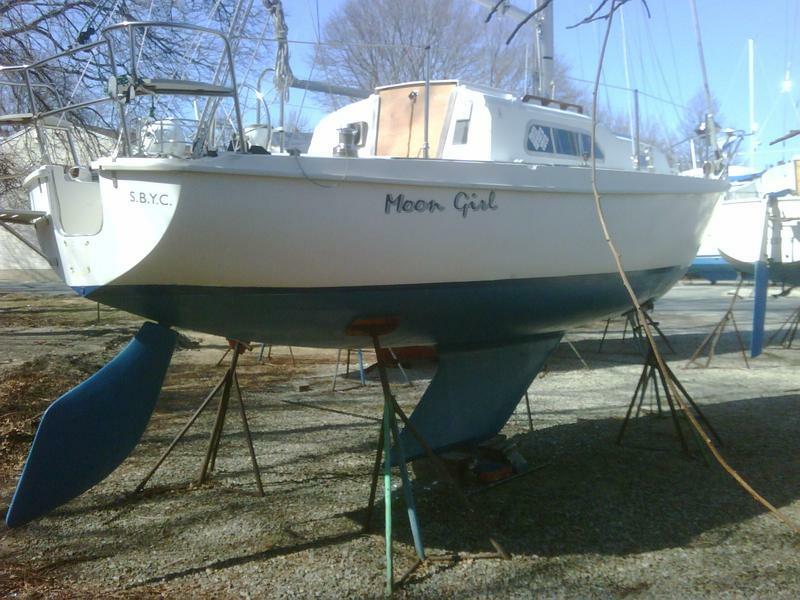 Pearson 26, fin keel, mast head sloop, wheel steering, rail seats – $4,995.00. 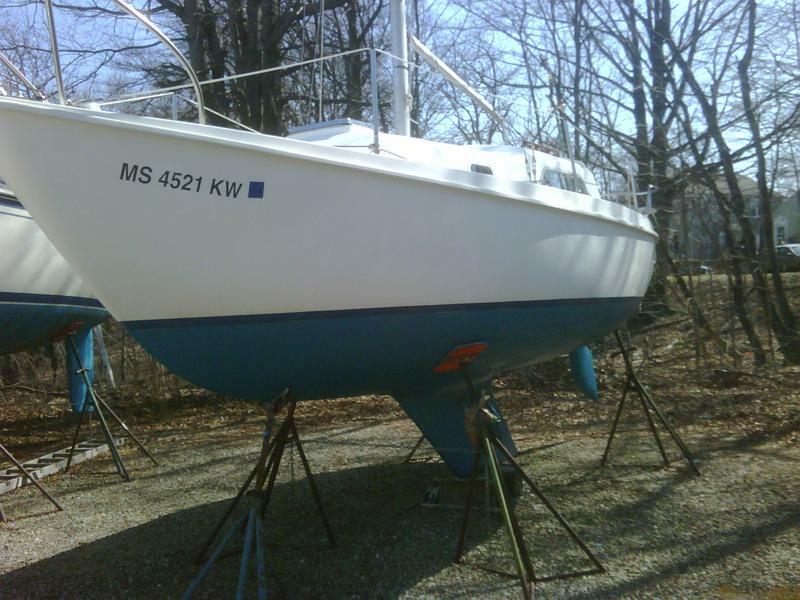 Boat has been sanded and painted (ablative marine paint) and is ready for spring launch. 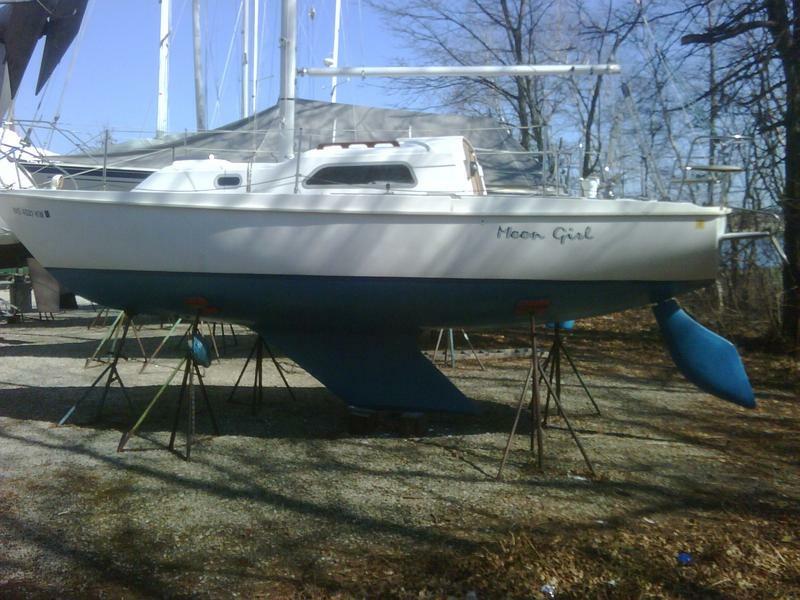 This sailboat is a fast for its size. 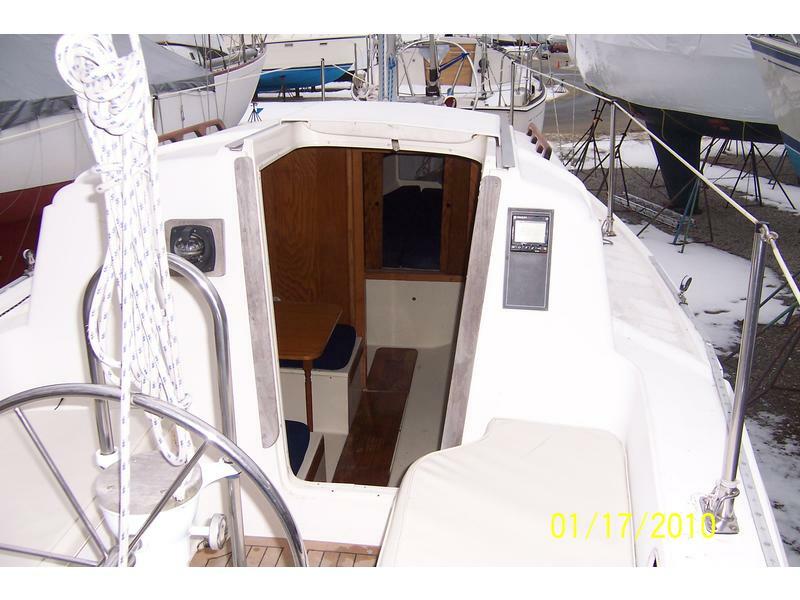 It can fit up to seven adults (7) in the cockpit for day sailing due to the two stern seats and wheel steering (6 ft bench seating). It may sleep up to five and has an enclosed head with sink. 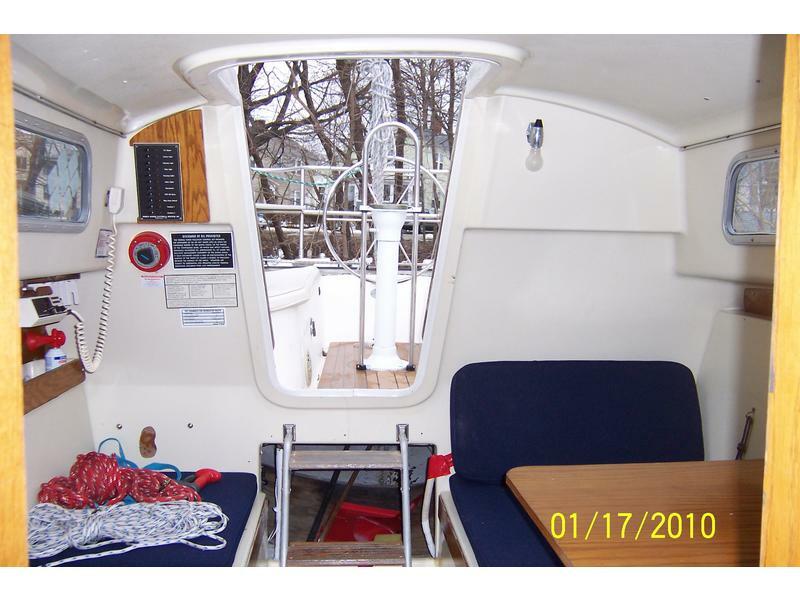 It includes life jackets, dock lines, fenders, custom made cockpit seat cushions, marine radio, compass, depth, speed meter and GPS. The rudder and bearings were replaced. The cockpit deck has a teak composite material for good looks and better traction. The stern rail was replaced to include seats. The entire boat was rewired professionally. There is wheel steering with an Edson pedestal and hand rail. The Genoa track was extended on deck to enable the boat to point higher. All standing rigging (stays) and running rigging (sheets and halyards) were replaced. 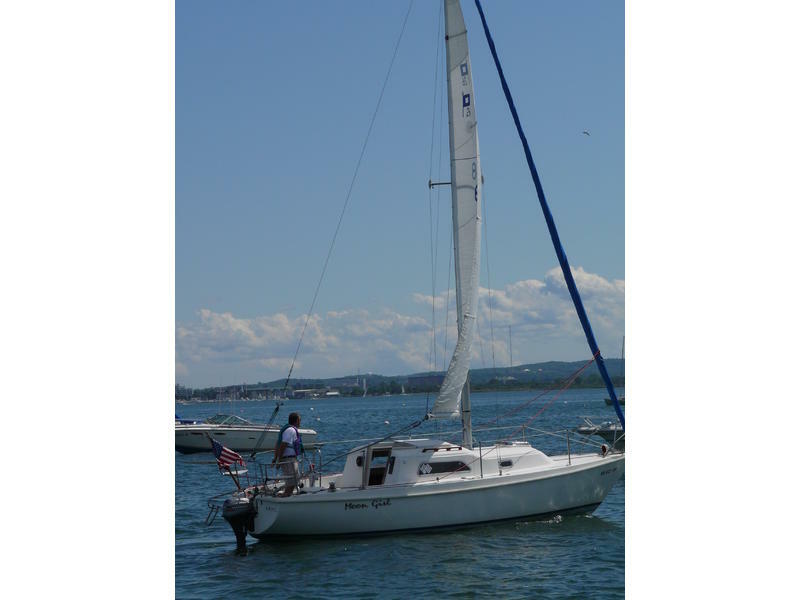 Neil Pryde sails for the Main and Genoa were new in 2(# removed). Spinnaker Sail is included. Outboard engine, Johnson, Six (6) horsepower, long shaft is included. Mooring may be available if needed. More Photos and related documents available. 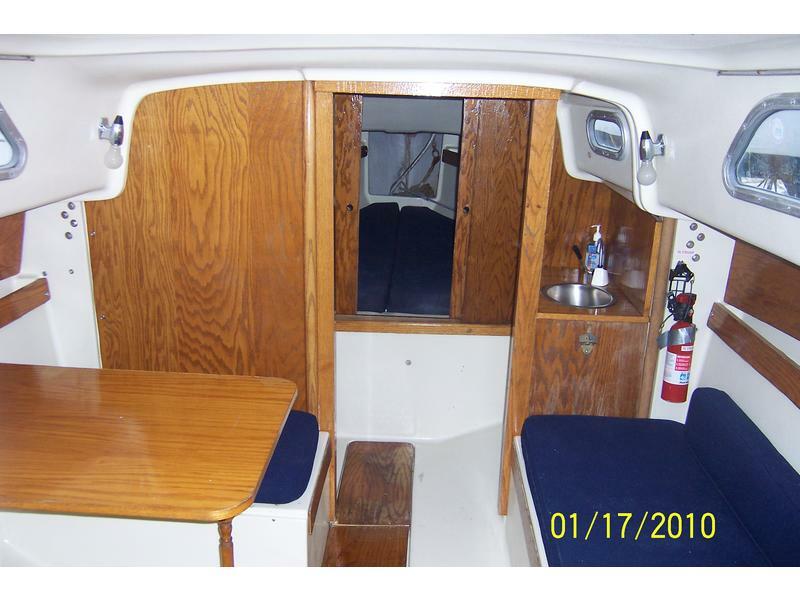 You may also make an appointment to view the Pearson 26 in Quincy. The rudder and bearings were professionally replaced with new custom built parts. The cockpit floor was resurfaced with high tech material to simulate a teak deck and does not require maintenance. The stern rail was replaced to include seats. 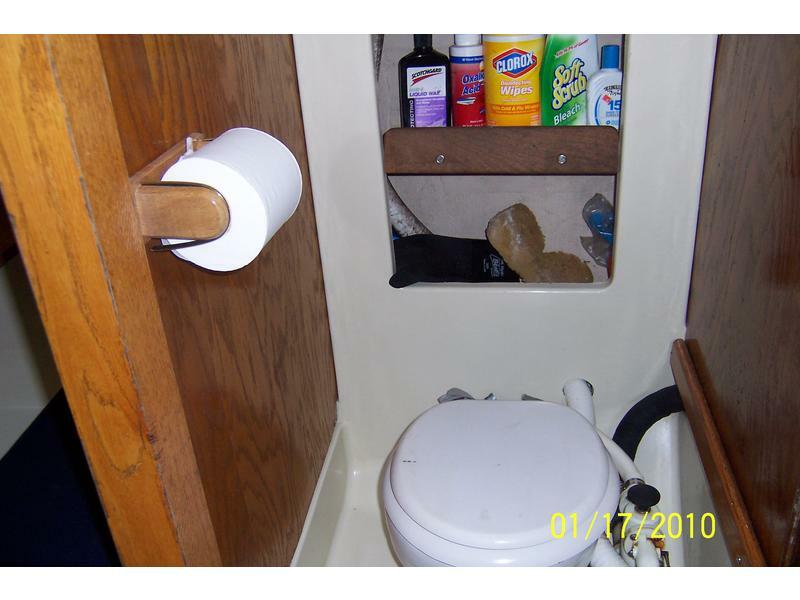 The entire boat was rewired to modern boat electrical standards (including, the main mast, bilge pump, interior fuse box and a battery switch). There is wheel steering with an Edson pedestal and hand rail. There is a Digital knot meter and Depth finder in the cockpit (bulkhead mounted). The Genoa track was extended on deck to enable the boat to point higher. 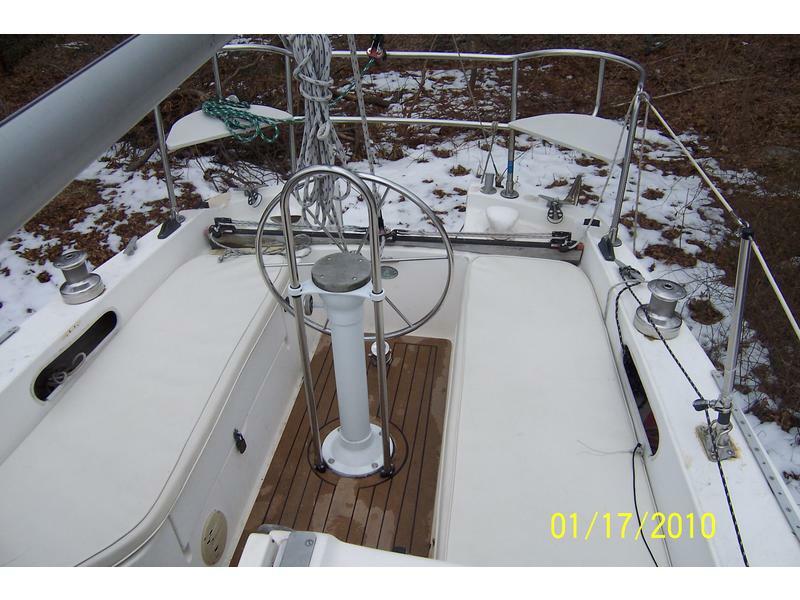 All standing rigging (stays) and running rigging (sheets and halyards) were replaced. The main mast compression posts were replaced with oak posts and a main beam. 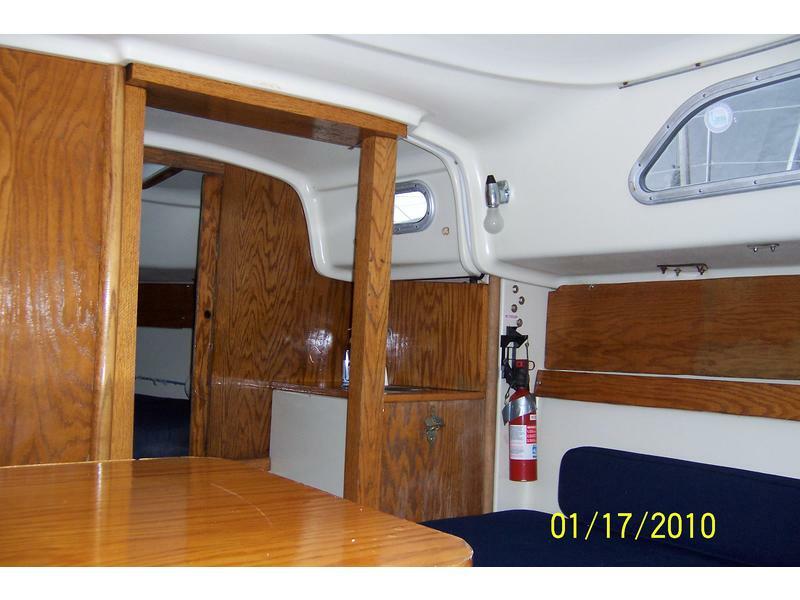 All the interior original laminate was replaced with oak plywood and stained. All cushions were recovered in Navy. Cockpit cushions were custom made. The drain in the engine well was replaced and enlarged to prevent clogging. 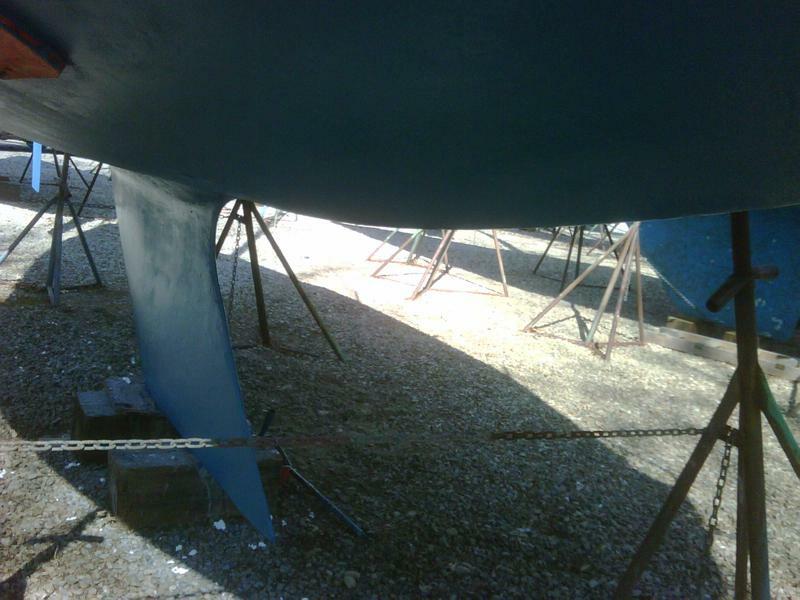 Historical bottom paint was stripped from the hull and fin keel. Ablative paint has been applied since to prevent paint build up. 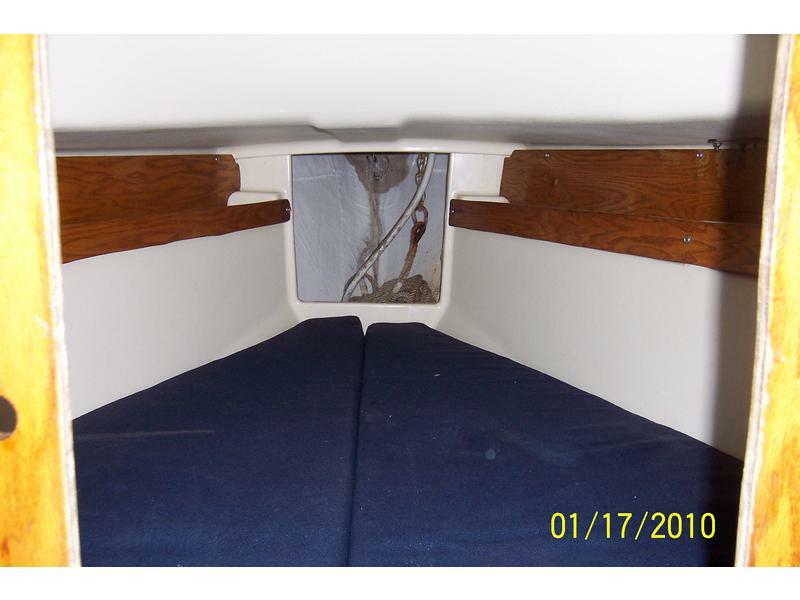 Original through hull fittings were removed, professionally sealed with fiberglass and new through hull fittings were installed. Neil Pryde sails for the Main and Genoa were new in 2002. 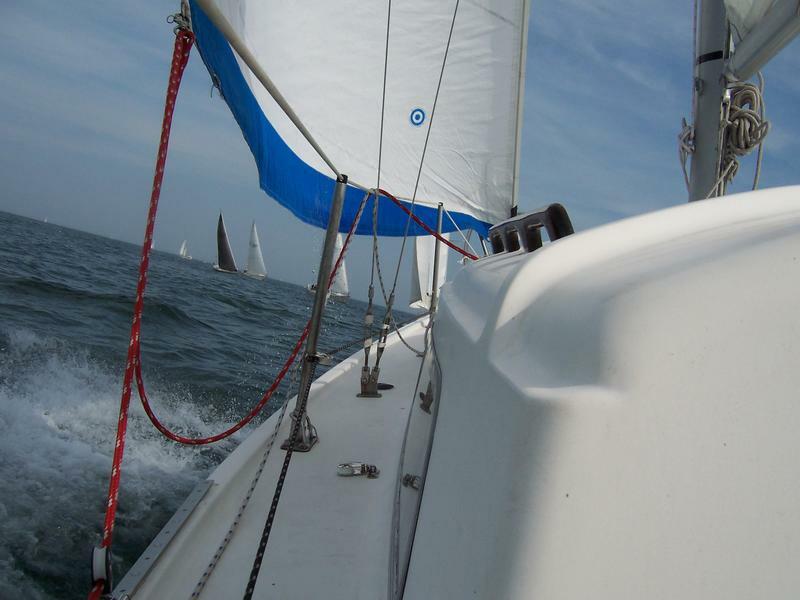 Spinnaker (with snuffer and gear to fly it asymmetrical style) is included.